I've been neglecting to update this blog, which is a shameful state of affairs not least because I definitely enjoy doing it. The fact that I seem to get as many, or sometimes even more, page views when I'm not updating this site will be of supreme disinterest to me from now on as I try to amend my errant ways. I know what the public want, which is for there to be less of me. As an avowed contrarian and noted sociopath, this is a challenge I couldn't turn down. One reason that I've not been hammering words into this fountain of knowledge is that I've rediscovered masturbation been doing a lot of art. So much art that it has come at the expense of other things. Principally among these other things is "selling art", which will perhaps not come as any surprise to anyone who has closely followed my business career. Nevertheless, I have been doing some moving and shaking in the creative community. I put together a collection of some of my better pieces and toddled off to Brighton to decorate (or decimate, depending on your point of view) the walls of Munch Coffee Shop in Kemp Town. If you're in the area you should definitely call in: the staff are friendly, the atmosphere is nice and the food and drink are made on site right under your very nose. Plus it is located just a couple of minutes' walk from the Brighton Magistrates Court, so there's always a chance you might see a defendant or two furtively skulking about with a muffin. This is all over the walls of Munch, Brighton. All but one of those pictures are on sale to the public, so just drop by the shop and have a look. If by some strange and inexplicable set of circumstances you don't live in Sussex, you can always instead drop me a line. Contact details, as ever, are in the sidebar on the right of the page. BUT WAIT! Getting all of this stuff out of the house to stretch its legs gave me a giddying glance of the joy of having a bit of space to put new things in. 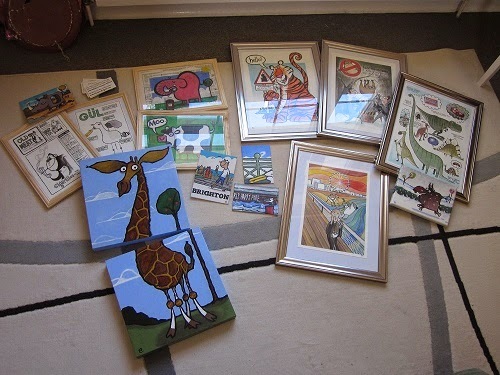 As such, I've got some other things that didn't make it in time for the walls of Munch but are just as excited by the prospect of finding new homes, away from the moths, at LOW LOW sale prices. Take a look. RHINO - 19 x 28cm, pen, ink and watercolour on 300 gsm paper. £40. ADELAIDE CRESCENT, HOVE - 28 x 38cm, acrylic and watercolour on 300 gsm paper. £75. DOG - 20.5 x 29.5cm, acrylic on recycled magazine page. £25. PACHYCEPHALOSAURUS AND STEGOSAURUS - both 15 x 21cm, pen, ink and watercolour on 300 gsm paper. £20 each or £30 for the pair. As ever, if anything catches your fancy, get in touch. My contact details are in the sidebar on the right of the page or you can click this link HERE to email me. If buying original artwork isn't your bag of pulses, you can always check out my Redbubble page. There you'll find all sorts of pictures I've done and there's also the option to buy them as prints, phone covers, tote bags, t-shirts or cushion covers. There are also some Christmas cards available to buy, for the fatalistic among you. But there'll be more about that closer to the time, no doubt. Putting a tree in your house is a pretty daft thing to do, when you really analyse it.